“It looks like you’re just pressing buttons.” It is perhaps the most common audience feedback received by the 8-bit chiptune composer, who uses vintage video game consoles to create original music. At a basic level, the chipmusician is “just pressing buttons,” as they control the various parameters of the sound chip using the same equipment and controllers with which the game is played—often resulting in the misperception that they are actually just playing video games on stage. Yet at the same time, the chipmusician must constantly reflect on his or her creative relationship to the 1980s video game culture from which his or her sounds originated: Is chipmusic simply a way to relive the sonic memories of one’s childhood, or is it a “progressive” form of electronic dance music? What happens to the music when you begin to integrate acoustic instruments into the mix? On a broader level, is it possible to sever the technostalgic connection between current chipmusic and the specific cultural historical moment from which the sounds originated? In an effort to reflect my role as a “participating observer” (Summit: 2009) in the chiptune community, this article often shifts its perspective between objective concerns—such as technical descriptions of instruments, and textual analyses of musical tracks—and subjective concerns—such as phenomenological descriptions of chiptune performances as processes, and the affective experience of performing music on video game consoles. In this way, I try to avoid alienating both the chiptune music “insider” and the reader unfamiliar with the music and culture. As a music scene that has only recently gained the attention of national and international media publications, the complex web of representation and identity formation for chipmusic is still in its infancy, and I hope this article reflects the diverse and multifaceted creative processes of a culture that is too often reduced to mere labels. In 2009, Ian Bogost and Nick Montfort published Racing the Beat: The Atari Video Computer System, initiating what they call “platform studies,” a book series that attempts to “investigate the relationships between the hardware and software design of computing systems and the creative works produced by those systems” (“Platform Studies”). Fundamental to their analyses is a spectrum of mediation ranging from the “platform… the most basic level of the media that can be programmed,” to the “interface… the front-end of the platform, from which reception/operation can occur” (Bogost & Montfort: 2009, 146). In examining the various levels of technological mediation that occur between the platform and the interface, hardware and software, technology and its users, Montfort and Bogost hint at the immersive aspect of our human relationship to machines. The various levels of chiptune “performance”—from composition to its “live” presentation—similarly present an immersive experience in which ontological categories of “live” and recorded, analog and digital, etc. are deconstructed. For the artists I will be discussing in this article, composition begins with the original DMG model Nintendo Game Boy, fitted with a modified Game Boy cartridge running a software program called Little Sound DJ, better known as LSDJ. As a “tracker” sequencer, LSDJ provides the user with a direct connection to the hardware platform for which they are writing music. The fundamental compositional unit in Little Sound DJ is the “Phrase” screen, in which the user inputs actual note names and octave levels along a one-bar column subdivided into a vertically streaming sixteenth-note grid (fig. 1a). The musematic microloops that result are then juxtaposed and arranged as discursive mesoloops in yet another vertical stream called a “Chain” (fig. 1b) (Middleton: 1990). 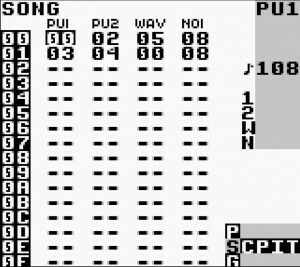 On the main “Song” screen of the program the user is presented with four columns, representing each of the four sound channels of the Game Boy sound chip—two pulse waves, a wave channel, and a white noise channel. It is here that various “Chains” are once again juxtaposed and arranged in a “live” setting, in which the user triggers the start of the various loops to form larger scale macroloops, most commonly representing the formal structure of full length tracks (fig. 1c). Fig. 1c “Song Screen”: the four sound channels of the Game Boy are represented as columns, under which phrase “chains” are added. Thus, row “00” (far left) represents a section of the song consisting of chains “00-03” in the respective sound channels. Row “02” represents a completely different section. In this quick and rather intuitive compositional process, immediacy is invoked through a conception of the software as “open,” all aspects of the graphical interface immediately accessible to the user. This compositional environment of highlights what Ragnhild Brøvig-Hanssen calls “Opaque mediation… the direct exposure of editing tools or processing effects, the ‘musical’ use of technological glitches or side effects, and the obvious deployment of samples” (Brøvig-Hanssen: 2011, 159). Perhaps most reflective of this mediating process is the “Command” feature of LSDJ, in which the user can input everything from effects, tempo changes, key transposition, time signature changes, amount of “swing” added to the groove, waveform selection, and the creation of arpeggios all within a single screen, and across multiple screens (fig. 2). Furthermore, the individual blocks of musematic, mesomatic, and macroloops that result from the construction of music along the tracker grid are represented as simple hexadecimal units, allowing the use of a single loop across the various sound channels of the Game Boy (i.e. a four-bar loop represented as “00” can be used in both the pulse channel as well as the wave channel, producing the same pitches and rhythms) (fig. 3). Using Mark Spicer’s description of “accumulative form—the gradual building up of a groove by adding sequential units cumulatively,” Karen Collins has noted the similarities between this method of composition and that of early video game music composers, who often built their works through the hierarchical construction of musematic, mesomatic, and macroloops (Collins: 2006). Thus from its earliest phases, the technical processes of chiptune composition were geared toward the act of opaquely mediating between the user and his or her interface. 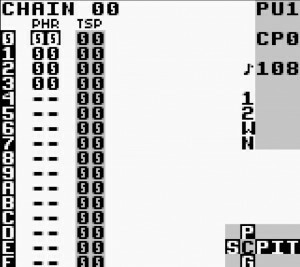 In the context of LSDJ, this “open” graphical user interface becomes a link between not only the user and the software interface, but amongst the individual patterns that—because of the hexadecimal representation—are literal references to each other. Musical patterns are represented within the software interface, the various screens acting as windows through which the user views the various hexadecimal patterns that have become embedded in the hardware platform. In this way, LSDJ becomes what chipmusician Anders Carlsson calls a “hypersequencer… a more abstract way of composing, offering a more efficient use of the platform since the composer defines links to reference other parts of the music” (Carlsson: 2010, 17). We may even describe the “live” improvisational potential of the “tracker” interface as more generally constituting an environment of “hypermediacy”; a space William Mitchell characterizes as “privileging fragmentation, indeterminacy, and heterogeneity… emphasizing process or performance rather than the finished art object” (Mitchell: 1994, 8). The resulting interface immediacy of Game Boy composition is furthered by the fact that the user is working with a mobile, pocket-sized device, editing and revising their works through the isolated aural environment of earbud headphones. In one way, it seems that chiptune music cannot escape its connection to video gaming, thus reflecting Serge Lacasse’s Bakhtinian idea of “intertextuality” as “the idea that all texts make sense only through their relationships with other texts.” Yet, chiptune artists see the situation as a bit more complicated. As James of Boston-based chiptune duo Bright Primate notes, “it’s a funny, fine line. I really think that for chiptune as a genre to grow, it has to be free of the nostalgia/videogame cage, but still be aware of it’s roots” (Personal interview, 2012). In response to this, Juan Manuel Larrazabal aka Kool Skull describes the potential of chipmusic to free itself from these connections: “the farther chipmusic gets from its roots, the more developed the music will become” (Personal interview, 2012). In the following analyses, I will examine the ways in which the “live” performance of chipmusic embodies, reflects, and challenges these cultural positions. The setting is Brooklyn, NY in the spring of 2007. Hundreds of chiptune musicians and connoisseurs from around the world have gathered for the second annual Blipfestival, a three-day audio-visual celebration of chiptune culture. As Joshua Davis—better known as Bitshifter, co-administrator of the 8bitpeoples chiptune collective as well as the co-curator of the Blipfestival—takes the stage, the audience looks on in anticipation at their idol, some cheering and smiling while others are clearly awestruck by his presence. Following a brief introduction, Bitshifter approaches his instrument accompanied by heavy applause, raised fists, and overbearing cheers. As he picks up the Game Boy, the video camera captures the intense gaze with which the musician confronts this thirty-year-old device; an uncanny moment in which an outmoded technology deemed dead by the storm of technological progress is revitalized at least momentarily. Indeeed, the glowing Nuby screen light of the Game Boy imparts a sort of lifeblood to the device, impressing upon the viewer a sense of fleeting temporality, as if the 8-bit sounds and visuals that they are about to experience may perhaps die away in the same manner as the drain of the device’s batteries. For chiptune musicians—many of whom came of age between 1980 and 1995, the heyday of vintage 8-bit and 16-bit video game consoles—it is the timbre of these consoles that seems to transport the audience to this historical moment. As Bitshifter begins his first track on LSDJ, the lo-fi bleeps and bloops with which his audience has grown up immediately recontextualize these listeners into a space of late 1980s video game culture. A colorful LED grid frames the performer’s space from behind, while extensive video editing places 8-bit screen glitches in the context of a “live” stage and audience presence. Video images of the performance provide a sense of motion which carries the viewer through the ironically fleeting experience enacted by the DVD recording, only to be interrupted by still shots that force a moment of focus and the realization that we are simultaneously being immersed in this performance, while also inherently detached from it; an ontological position definitive of the broader video game experience, as detailed by Kiri Miller in her 2008 article on Grand Theft Auto: San Andreas (Miller: 2008). The ‘just pushing buttons’ mentality fails to capture the feeling and the appeal of the gameplay [or musical performance] for most players [musicians]—much as it would fail to capture the feeling of playing a Chopin nocturne on the piano, which might also be described in these terms (Miller: 2009, 408). Indeed, beyond the technical level all “live” musical performances are based on a phenomenological experience of the epistemological musical text. It is that “feeling” we get from physically interacting with the materiality of sound; an affective experience generated by physical engagement and heightened listening, creating a nostalgic “affective affinity” with the machine (Miller: 2009, 411). Compositionally, Bitshifter’s tracks further this immersive connection to a nostalgic video game experience. The musical foundation consists of a downtempo circular I-ii progression in E-flat major, arpeggiated and doubled at the upper octave, with a 2-3 accented passing tone providing an anticipatory gesture. In terms of functional tonality, the progression goes nowhere, lacking a stable dominant harmony with no leading tones to suggest linear motion. Yet, as the sonic progression mediates between the sound chip of the Game Boy to the ear of the listener, it does not fail to move—or at least recontextualize—our listening space. This occurs most notably through the melancholic gesture of the 2-3 anticipation, sustaining at the climax of the arpeggio and emphasizing an ephemeral longing for (e)motional release, only to be fulfilled by the descent to the root of the chord (fig. 4). Furthermore, a particular agitation is created by the timbral features of the wave channel instrument created specifically for this pattern. Harnessing the full synthesizer capabilities of Little Sound DJ, Bitshifter chose to “Loop” a single synthesized tone upon itself as the primary sonic material of this pattern, giving the arpeggio an anxious, rapidly vibrating quality. Each micro repetition of the short waveform causes the synthesizer to jump an octave, giving the listener the impression that two sound channels are voiced simultaneously when in fact we are only hearing a single instrumental channel. The circular aspect of the I-ii chord progression as a foundational figure is thus mirrored on an external level by the sonic gesture of the synthesized waveform, giving the progression a strong sweeping motion. Making the most out of limited sonic resources, as well as utilizing short, circular harmonic progressions, allows Bitshifter to take the listener off the stage, and into the imaginary world of the 8-bit video game. On a more fundamental level, this music is reminiscent of many Nintendo games of the late 1980s and early 1990s. Harmonically, two-chord circular progressions are common as opening title music, from Nintendo’s Airwolf to Uchuu No Kishi—a popular Japanese Game Boy game—as well as the title theme to what Bitshifter has in interviews claimed as his favorite game, Balloon Kid, also noted as his first introduction to chiptune music (Gourley: 2011) (fig. 5). On the other hand, the melancholic sentiment of the track—typified by a downtempo groove that sharply contrasts between a high pitched melody and a low bass—resembles popular closing themes, including the “victory” theme of Dr. Mario. As a side note, it is not surprising that the opening and closing musical themes of 8-bit video games become the most memorable, as they represent both the first moments of immersion in the game as well as the final moments which take us out of the game world. Of course, it is not solely the sound that immerses us into the nostalgic listening space of the “game,” but the physical gestures of the “live” performance as well. The video gaming experience is a mediating experience that highlights what Miller describes as the “creative aspects of role-playing—jumping into the artist [or video game in this case] in their time, imaging another form of rock star identity” (Miller: 2009, 417). Emphasizing postures of struggle and triumph, Bitshifter’s physical performance evokes the masculine gaming metaphor of the individual against the world. He approaches the game with nervous hesitation, his eyes never leaving the screen. His hands slowly move over his equipment, raising and lowering volume levels, and adding slight changes in tempo. As the noise channel enters with a crushing drum pattern he throws a fist into the air, mirrored by his audience, who immediately springs into frenzied movement. Here, the meaning of the sound of the 8-bit video game meshes with notions of masculinity, technology, and an illusion of gendered control, relating to what Bill Nichols describes as “an obvious gender coding that gives almost all video games a strong aura of aggressive, militaristic activity” (Nichols: 1988, 31). Verily, it be the nature of dreams to end! When I dost awaken, the land will be gone. Only the memory of this dream land will exist in the waking world. Someday, thou may recall this land, and that memory must be the real dream world. As constant fades and scene changes distort the gamer’s space of performance, the distinction between “real” and “dream” world becomes less stable. In the final moments of the game, music is used to mediate between these spaces of “real” and fantasy, past and present, the virtual and the here-and-now. As Link performs the “Ballad of the Wind Fish” on his ocarina, memories of the past cycle through his memory in the form of a visual montage. As the credits begin to roll, he wakes up alone on a raft in the middle of the sea, the melancholic melody still cycling through his head. He cannot help but smile, having reawakened the ancient Wind Fish. The thing that anybody who works with older technology has to deal with is, am I a retro dinosaur, or am I creating something new? (Reformat the Planet: 2009). Some artists feel that the sound of chipmusic will maintain an essential link to nostalgic feelings of childhood video gaming, as Glomag notes, “anybody using 8-bit technology is gonna evoke those feelings whether it’s intentional or not” (Reformat the Planet). On the other hand, many musicians—“new” and “old”—look at the “live” presentation of chipmusic as a way of negotiating technological hardware of the past with current forms, Nullsleep going so far as to claim, “it really doesn’t have to do with video games at all. It has to do with using video game hardware to create music” (Reformat the Planet: 2009). Indeed, artists such as The Attic Bits have used the “live” stage as an open forum for exploring the digital materiality of present technology by combining past and present tools to create 8-bit soundscapes. In their typical “live” setup, The Attic Bits utilize two Nintendo Entertainment Systems, at least two Game Boys, an Akai MPC drum machine, sampler, and sequencer, the MIDI keytar from the video game Rock Band 3, and an iPad, both used to control sounds from each of the entertainment consoles. In a sense, The Attic Bits’ use of multiple Game Boys and NES consoles as primary instruments in a “live” setting distinguishes them from other electronic dance musicians, as they connote—both visually and culturally—intentional values of “vintage technology” and “gaming” which ultimately assert ideological choices connoting “geekiness”; an unabashed value of the chiptune community, yet a polar opposite to the perceived “coolness” of the club DJ. However, The Attic Bits’ performance of “The Old Groove”—a track off of their second album, The Field of Dismay—in a live setting actually connotes a physical connotation that is closer to DJ performance than chiptune performance. As reflected in my analysis of Bitshifter, many chiptune performances occur from the Game Boy, as an immersive relationship is constructed between the user and the interface. The Attic Bits, however, layer their tracks from the iPad, MIDI keytar, and the MPC sequencer, thus transferring information to the Game Boy and Nintendo from newer technologies. In order to synchronize the resulting musical layers, each member of The Attic Bits must “BPM Sync” their individual instruments to each other. A common practice taken from turntable DJing, this further distances their performance practice from a nostalgic, textual variety, to one that values an intertextuality that transgresses the medium of the Game Boy, and explores the digital materiality of the relationship between new and old technologies. As Richard Middleton writes, “meanings result from the social context of performance and reception; but the performance itself has metamusical aspects” (Middleton: 1990, 242). I would argue that Middleton’s use of “performance” in this quote is a kinesthetic one, reflecting the metamusical realm of musical meaning. As noted earlier, chiptune performance is often centered aurally and visually on the Game Boy, and in this way the kinesthetic involvement of the performer connotes an experience that is quite literally akin to playing a video game. In contrast, the “deep structures” accompanying an Attic Bits performance connote a “real world” presence. Standing together on stage, The Attic Bat and Arkbit perform as a duo, using keyboards, drum machines, and iPads to layer multiple tracks on the Game Boy and Nintendo, thus externalizing the musical interface. Here, the combination of recognizable musical tools with their virtual counterparts serves to combine multiple communication functions outlined by Russian linguist Roman Jakobson, including the referential, aesthetic, and emotive (Middleton: 1990, 241). In emphasizing the visual aspects of the music’s construction, The Attic Bits therefore highlight their own assertion of musical meaning, reflecting Sean Cubitt’s argument that “we cannot say that the song has meaning, but rather that it means, that it produces meaning” (Middleton: 1990, 240). For The Attic Bits, meaning arises not from the seemingly innate codes that arise from the technological interface, but rather from the “live” negotiation that occurs between the technology of video game music and the performativity of electronic dance music in general. This position lies in-between the “text” and the “inter-text,” an inherently mediating position reflected by the etymology of the word “retro”; the two positions of “retro” and “active” assert a pastness which is always actively present, or at least that liminal space in-between past and future, perhaps best embodied by the chiptune musician. In the opening moments of the 2009 chiptune documentary Reformat the Planet, the viewer is introduced to a postindustrial world invaded by 8-bit sounds and images. Following the initial opening credits—consisting of excerpts from Bitshifter’s Blipfest performance—“live” audience applause crossfades to a pixelated panorama of the New York City skyline. Car horns, industrial noise, and waves crashing on the Hudson Bay are juxtaposed with 8-bit filter sweeps and white noise swells. We are soon ushered into the more intimate setting of Nullsleep’s apartment, in which framed photos detail these juxtapositions of past and present space, “real” and virtual; a coin box and a cloud, a green sewer tube above a city manhole, a mushroom enemy among a flock of pigeons, all mixing the environment of the 1985 Super Mario Brothers Nintendo game with the current space of a Brooklyn apartment complex. Finally, we are introduced to the mad scientist behind these creations as the video camera captures a close up shot of Nullsleep making music on a single Game Boy using Little Sound DJ, as if he had been reformatting our world all along. With cybernetic systems, this other scene from which complex rule-governed universes actually get produced recedes further from sight. The governing procedures no longer address us in order to elicit a suspension of disbelief; they address the cybernetic system, the microprocessor of the computer, in order to absorb us into their operation. The other scene has vanished into logic circuits and memory chips, into ‘machine language’ and interface cards. The chip replaces the copy… the automated intelligence of chips reveals the power of post-industrial capitalism to simulate and replace the world around us… The copy reproduces the world, the chip simulates it. It is the difference between being able to remake the world and being able to efface it (Nichols: 1988, 33). In the end, chipmusic does not act as a way of escaping the world, rather it asks us all to take a deeper look at those parts of the world that we too often accept as static and fixed. The “live” performance of chiptune, and the global community that has grown out of it, serves as a public forum in which socio-cultural change is negotiated. Constantly reacting to critics who claim chipmusic as a novelty, a cultural time bomb about to explode at any moment, “live” performers breathe life into old machines, thus providing the listener with a sense of what Jonathan Crane calls “interpretive instability,” in which the public presentation of artifacts from the past “ultimately make us even more aware of our affective place in the present” (Theberge: 1997, 205). His face is turned toward the past. Where we perceive a chain of events, he sees one single catastrophe which keeps piling wreckage upon wreckage and hurls it in front of his feet. The angel would like to stay, awaken the dead, and make whole what has been smashed. But a storm is blowing from Paradise; it has got caught in his wings with such violence that the angel can no longer close them. This storm irresistibly propels him into the future to which his back is turned, while the pile of debris before him grows skyward. This storm is what we call progress (Benjamin: 1968, 257). Chipmusicians inhabit that liminal space between past and future; a present that is both proactive and preemptive, a transformative space of flexibility highlighting the material plasticity of historical construction. In a constant state of transition, these performers reclaim technological agency from the dominant narrative of progress, reinforcing the malleability of our historical identity through the metaphor of our technological past, constantly reminding us that those broken aspects of our lives—which we too quickly attempt to forget—perhaps just need a little reformatting. This article came about as a sort of “self-ethnography,” based both on my experiences performing with and hanging out with the chiptune community throughout New England, as well as setting up shows, jamming, and waxing poetic with fellow chipmusician and video game expert, Jeremy Murphy aka Arkbit. Much love and respect to the chiptune community for their intense dedication to the art, great shows, great times, and their unending insight on the topic of “live” chiptune performance. Special thanks to Boston8Bit, Bright Primate, Ulysses Campbell, Congress of the Sloth, Leeni, Active Knowledge, Kool Skull, Wet Mango, Oxygenstar, Doomcloud, Disasterpeace, A.J. Dudick, I am noun, Machinery of Nature, Nomstar, 8-Bit Weapon, Spacetown Savior, Bleeds, Forest World, OK Ikumi, DJ Radio Scotvoid, VJ Beyonder, Mister Spastic and MANY others. Chipmusic is very much a response to the constantly changing sound technologies in the video game industry, thus making it hard to pin down historically. Some may point to early video game music composers such as Toshio Kai (Pac-Man, 1980) or Yuriko Keino (Xevious, 1982) as the sonic originators of the genre, while others may look to the “demo” scene of the late 1980s for the culture’s roots. In this scene, computer programmers and musicians such as Jeroen Kimmel and Chris Hulsbeck would first “rip” music from video game consoles (most prominently the Commodore 64), and then code music software editors of their own. In any case, chiptune music, chipmusic, 8-bit music, or whatever you want to call it, has now become a global music community of enthusiasts, computer programmers, and musicians which generally prides itself on repurposing outmoded video game consoles in order to create original or remixed music. Much of the communication between artists and performers, as well as general discussion regarding the “scene,” occurs through online forums such as http://chipmusic.org/ and http://8bc.org/. For a comprehensive list of “essential” chiptune recordings distinguished by style (a list which constantly outdates itself), check out http://www.reddit.com/r/chiptunes/comments/pq72m/what_chiptune_albums_would_you_consider_as/. The term “technostalgia” is borrowed from a chapter title of the same name in Taylor, T. (2001) Strange Sounds: Music, Technology, and Culture. New York & London: Routledge. For some notable examples of “mainstream” media attention to chipmusic, see Danzico, M. (2011) Chiptune: Creating Music Using Old Video Game Technology. In: BBC News. [Online]. March 11th. Available at http://www.bbc.co.uk/news/world-us-canada-12774683 (Accessed: March 2011), Artsay, A. (2010) From Tetris to Chiptunes. In: NHPR Word of Mouth. [Online]. July 22nd. Available at http://www.prx.org/pieces/51591-from-tetris-to-chiptunes (Accessed: July 2010), and Primate, B. (2010) Mesmerizing Electro-Pop: Music Inspired by Video Game Consoles. In: Fox News: Fox & Friends. [Online]. July 10th. Available at http://vimeo.com/13228216 (Accessed: July 2010). The annual Blip Festival is hosted by the “8bitpeoples” online chipmusician community based out of New York City. Since its inception in 2006, it has expanded outside of New York to Denmark (2009) and Tokyo (2010). For more information on this event—as well as downloadable music, Blip Festival DVDs, and other merchandise—check out http://www.8bitpeoples.com/. For a more in-depth look at the topic, be sure to check out Reformat the Planet, a 2009 DVD documentary released by 2 Player Productions. Adorno, T.W. (2005) Minima Moralia: Reflections on a Damaged Life. London and New York: Verso. Auner, J. (2002) Making Old Machines Speak: Images of Technology in Recent Music. In: ECHO: a music-centered journal. 2, 2. Benjamin, W. (1968) Illuminations. New York: Schocken Books. Bogost, I., and Nick Montfort (2009) Racing the Beam: The Atari Video Computer System. Cambridge, MA: MIT Press. Brøvig-Hanssen, R. (2010) Opaque Mediation: The Cut-and-Paste Groove in DJ Food’s ‘Break’. In: Danielsen, A. (ed.) Musical Rhythm in the Age of Digital Reproduction. Burlington, VT: Ashgate, pp. 159-177. Carlsson, A. (2010) Power Users and Retro Puppets: A Critical Study of the Methods and Motivations in Chipmusic. MA thesis. Lund University. Guffey, E. (2006) Retro: The Culture of Revival. London: Reaktion Books. Lacasse, S. (2000) Intertextuality and Hypertextuality in Recorded Popular Music. In: Talbot, M. (ed.) The Musical Work: Reality or Invention? Liverpool: Liverpool University Press, pp. 35-58. Lanza, J. (2007) Elevator Music: A Surreal History of Muzak, Easy-Listening, and Other Moodsong. Ann Arbor: University of Michigan Press. Mera, M. (2009) Invention/Re-invention. In: Music, Sound, and the Moving Image. 3, 4, pp. 1-20. Middleton, R. (1990) Studying Popular Music. Philadelphia: Open University Press. Miller, K. (2008) Grove Street Grimm: Grand Theft Auto and Digital Folklore. In: Journal of American Folklore. 121, 481, pp. 255-286. —. (2009) Schizophonic Performance: Guitar Hero, Rock Band, and Virtual Virtuosity. In: Journal of the Society for American Music. 3, 4, pp. 395-429. Mitchell, W.J. (1994) The Reconfigured Eye: Visual Truth in the Post-Photographic Era. Cambridge, MA: The MIT Press. Montano, E. (2010) ‘How Do You Know He’s Not Playing Pac-Man While He’s Supposed to be DJing?’: Technology, Formats and the Digital Future of DJ Culture. In: Popular Music. 29, 3, pp. 397-416. Nichols, B. (1988) The Work of Culture in the Age of Cybernetic Systems.” In: Screen. 29, 1, pp. 22-47. Reformat the Planet. Dir. Paul Owens. 2 Player Productions, 2009. DVD. Summit, J. (2009) “The Participating Observer: Fieldwork in Jewish Settings.” Paper presentated at The Jewish Music Forum, Center for Jewish History, New York. Taylor, T. (2001) Strange Sounds: Music, Technology, and Culture. New York & London: Routledge. Theberge, P. (1997) Any Sound You Can Imagine: Making Music/ Consuming Technology. Hanover, NH: Wesleyan University Press. Anamanaguchi, Dawn Metropolis. [CD/Vinyl/MP3] Normative, 2009.